← The proof is in the pudding….er…I mean…. spam. Maybe you can’t teach an old dog new tricks, but you can teach him to play the piano. Those of you who have followed me for a long time are aware that I lost my older brother to early onset Alzheimer’s. He was my only sibling. We were first aware of changes when he was around 59. He was officially diagnosed a couple of years later. He died of complications at age 69. Having a first degree relative with Alzheimer’s increases your likelihood of having it two or three-fold, depending on what medical article you happen to read. In any case, it’s alarming enough to make one do whatever one can to prevent an occurrence of this cruel and ravaging disease. You’ve no doubt heard the axiom “use it or lose it” or that it is just as important to exercise your brain as your body. This is especially true for anyone with elevated risk for Alzheimer’s, or for any person in their “senior” years, for that matter. I’ve certainly taken it to heart. I’ve always had a bent toward puzzles, brain teasers and word problems. Actually, problem solving in general. I’m certainly not in the genius range at any of them, but the challenge and satisfaction in deciphering them is very rewarding. Now, of course, it is more important to me than ever. Every day, without fail, I attempt at least four different types of puzzles. While this may seem laborious to many, I look forward to it. I usually start out with the “Daily Jumble”. This is the only game that is timed, which adds a bit of excitement. It’s basically unscrambling four words to find the letters (which are also scrambled) that reveal the answer to a picture puzzle. You may have seen this in your daily newspaper. Next comes the “Jigzone.” These are online jigsaw puzzles with a twist. There are over 20 variations of cuts, including the old standard cut that you remember as a kid. You can select the number of pieces from 6 to 250 to increase the difficulty. Click on this to enlarge. 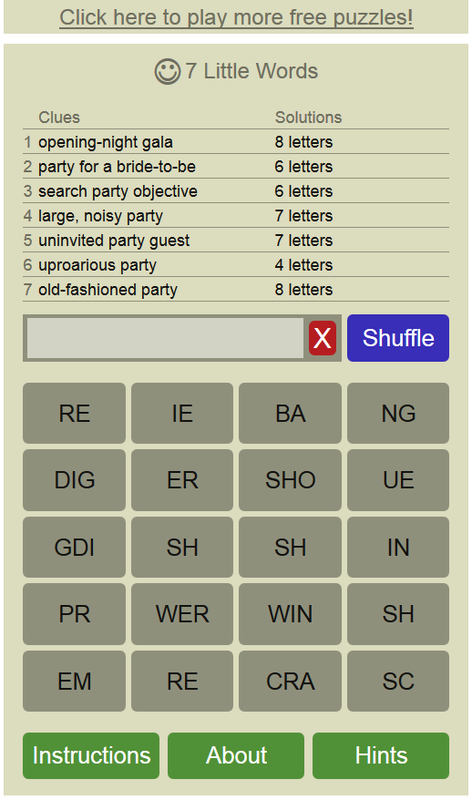 I follow this up with “7 Little Words”, a relatively new game pitting your skills at recognizing words from a pool of broken syllables to fit seven different definitions. Quite challenging and a good way to improve your vocabulary. Lastly, “Red Herring” rounds out the morning’s anti-Alzheimer’s activities. This game requires you to match four scattered words that have a common theme (ex: parts of an automobile) from three different categories. 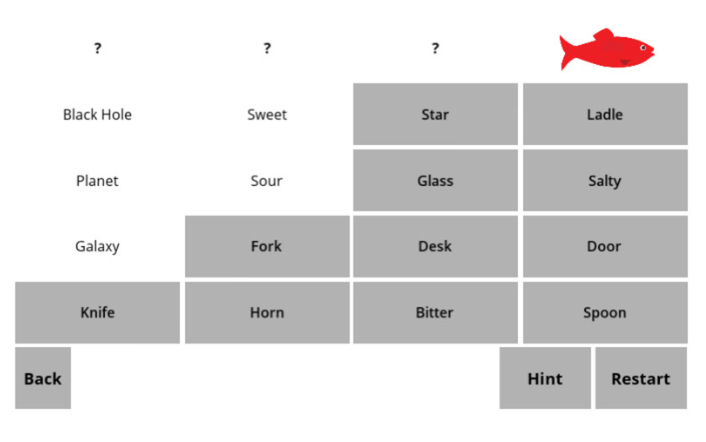 Also included are four “red herring” words that are similar, but not in the correct context of the categories. There are three degrees of difficulty, from beginner to hard. To top this all off, at the beginning of the year I started taking piano lessons. That means practicing every day. I have no musical background whatsoever, so for me this is like learning a new language. Reading music and playing an instrument have always been a desire of mine, but it took retirement to get me to overcome my fear of this cryptic yet beautiful world. I’ve bought a shiny new keyboard so if you’re ever in the area, stop by for a private recital of “When the Saints Go Marching In.” It’s the only piece in which I yet have any confidence. 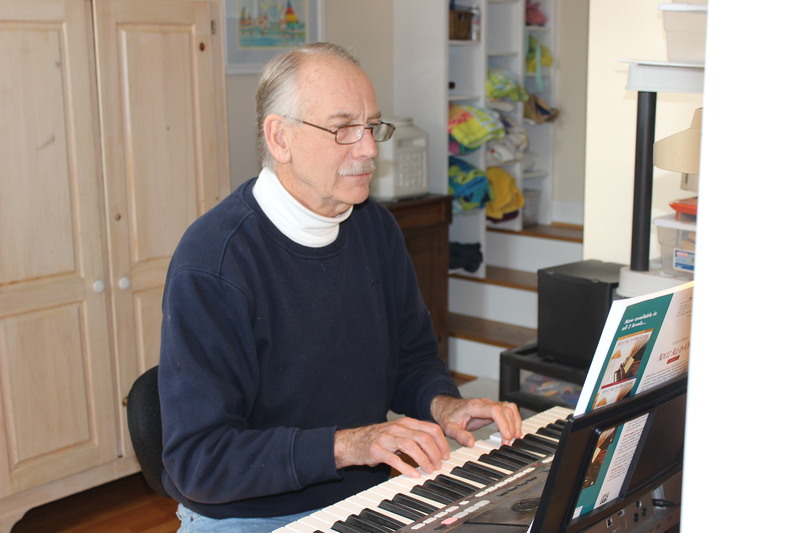 This entry was posted in Family and tagged Alzheimer's, brain teasers, piano, puzzles. Bookmark the permalink. 23 Responses to Maybe you can’t teach an old dog new tricks, but you can teach him to play the piano. I know how to play ‘When the saints go marching in’ on the tin whistle!! Maybe we could do a duet? I’d love that. By the way, I now know how to play “Cockles and Mussels”….did you know Molly Malone? The makers of 7 Little Words and Red Herring also have Moxie. I’ve added it to my games. I didn’t know word jumbles were digital. I like cryptograms, too, but I haven’t looked for an app for those. Good for you learning to play the piano! I didn’t remember hearing about the loss of your brother. Sorry to learn that, Al. Thanks, Patti. I’ll check that Moxie game out. I’m so sorry to hear about your brother, even though I realise it was some time ago but diseases like Alzheimer’s are so cruel that I long to hear of a cure being found for them. My middle daughter works at a University researching the illness and I’m always very proud that she does something so valuable to many of us. On the question of those very useful and challenging games. I’ve always been useless at crosswords, board games and many other things which are too numerous to list here, but I love music and play the piano to a degree many others wish I didn’t, but that’s another story. Maybe you could try doing some tongue twisters while you tickle the ivories… 😉 I’m sure that sharp brain of yours would love the challenge! I would, but I can’t stop laughing at how you sh– a sheet! If only I hadn’t been so impressed with myself at getting through it once without saying the “sh**” word! My wife absolutely loved that video! Good for you for keeping the old noggin in tip-top shape! I do sudokus all the time, but I think I need to try something new. I also like those “power of deduction” puzzles. You know, like “The killer was sitting next to the barber, the baker had red hair, the woman on the couch with black hair was named Jane, etc. etc. I am truly not very good at Sudoku. Guess it goes back to my weak math skills. I’m no good at the deduction puzzles. I know you’re supposed to make a grid to aid in solving, but I can never remember how to make the grid so I’m stopped before I start. Thanks for telling me about the new games…that is they’re new to me. 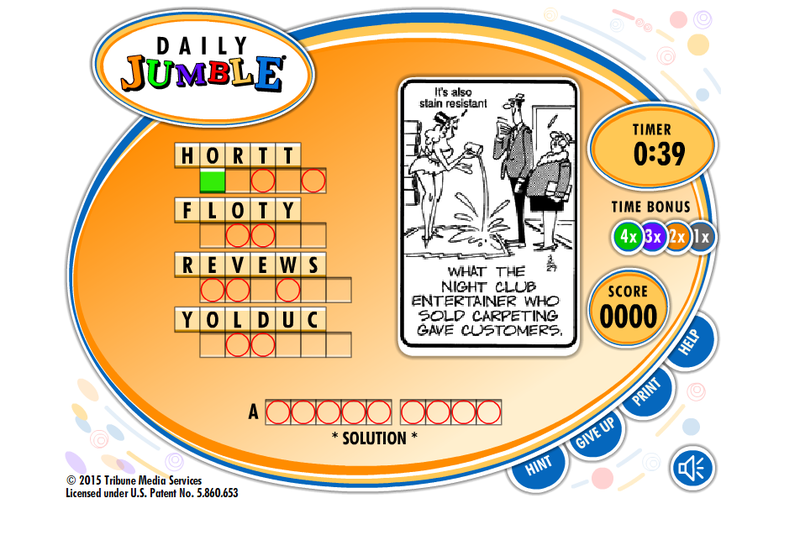 I used to play jumble every day and must get back to it. I think my brain is taxed though…tutoring two “foreigners” (one from Brazil, one from China) at separate times…in English, the oddest language of all. Did you know there are eight different sounds for “ough”? I’d tell you what they are but I forgot! You are right, you get plenty of brain exercise with the tutoring. I volunteered with “Literacy for Adults” for a while. I remember trying to teach homonyms, homographs and homophones. This saint would march in just to hear you play! I knew it! You’ve been too modest all this time, Marie. Read Ayaan Hirsi Ali piece in today.’s Washington Post p. A17.. Just got her new excellent book. Al, this is great! Only this morning I was encouraging David to take a bath and do something which challenges his mind, after he told me he had a bath two days ago. Keeping a calendar, making lists working puzzles all are good. Congratulations on getting the Saints to march. My one and only masterpiece years ago was Greensleeves.